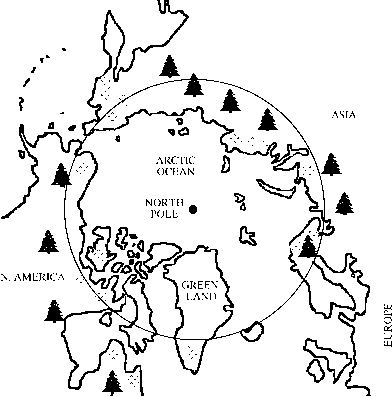 figure 2.8 Map of the Arctic region, showing the Arctic Circle and the approximate position of the treeline (the northern extent of coniferous forests) and areas of tundra. Key: ^ treeline '-:• tundra diversity of the Arctic biota will become even greater than it is at present. Climatic conditions in the Arctic are less extreme than those in equivalent latitudes in the Antarctic. This is because the Arctic ocean retains heat better than the land mass of the Antarctic and warmer air and water are carried to the Arctic from more temperate regions. The Arctic is generally defined as the area north of the treeline, where the great coniferous forests of Europe, Asia and North America cease. This corresponds to the area where average summer monthly temperatures do not exceed 10°C. The dominant environment is tundra - large tracts of treeless open land north of the Arctic circle where the ground thaws during summer. Tundra is a form of grassland and covers one-tenth of the Earth's land surface. The main types of vegetation are grasses, sedges, reeds and woody shrubs such as heather. There are over 400 species of flowering plants (the Antarctic Region has only two). Mosses and lichens are common and form a ground cover beneath the other vegetation. Although the Arctic is defined as being north of the tree line, there are in fact two species of trees - the dwarf birch and the Arctic willow - which form low-growing shrubs. All Arctic plants are dwarfed and grow close to the ground. This protects them from the fierce wind and from blasting by snow and dust. It also means they are more likely to be covered and protected by snow during winter. Temperatures close to the ground are generally higher than air temperatures. Other adaptations which tend to raise the temperature of plants include the dark colouration of leaves and flowers, the dense growth of stems and leaves, hairs which trap an insulating layer of air and the parabolic shape of some flowers which tends to concentrate the heat of the sun. The roots of the plants may be restricted to the upper layers of the soil which are warmer and better drained. The vegetation can only grow when the sun melts the snow and the surface of the soil in summer. The water is prevented from penetrating into the deeper layers by the permafrost (permanently frozen ground) beneath the soil surface. In spring, the soil surface becomes saturated with water, providing for a flush of growth. If it were not for the permafrost, the spring meltwater would rapidly drain away and plants would not be able to grow. The soil dries out in summer, however, and the vegetation then has to rely on rainfall. This is generally low, resulting in semi-desert conditions in many places. The snow is not only important for providing water in the spring but it also protects the plants and animals beneath it from the harsh winter conditions. However, plants cannot grow much until the snow cover melts. The growing season is thus short and plants have to flower and set seed very rapidly. They are helped in this task by the continuous daylight that prevails for one to four months over summer. The flush of spring growth provides abundant food for animals. There are over 2000 species of free-living arthropods in the Arctic (including spiders, mites, springtails and insects). This compares with about 140 in the Antarctic (mites, springtails and two midges) and over 25000 in the United Kingdom. The largest group of insects are the Diptera (flies), with over 50 per cent of insects recorded from Arctic North America belonging to this group. Like the plants, Arctic insects only have a short period of the year in which they can grow. Many different life cycle patterns are found, with insects overwintering as adults, eggs, larvae and pupae. Most take two or more years to complete their life cycles. An extreme example is a moth, Gynaephora groenlan-dica, which lives in Arctic areas of Canada and Greenland. At Ellesmere Island in the Canadian Arctic (which is 78° N), their life cycle can take up to 14 years to complete. There is no special stage for surviving the winter and the moth can overwinter as any one of a number of different larval stages. The larvae survive the winter in a frozen state and resume their development for a brief period during the summer. Other insects, however, can complete their development in one season. At Lake Hazen, also on Ellesmere Island, mosquitoes lay their eggs in south-facing sites. These sites clear of snow first in the summer and the eggs receive the maximum amount of sun, allowing their rapid development and hatching. Arctic insects tend to be small, dark and hairy - or at least more so than their relations from more southerly regions. This helps them gain and retain heat. Insects bask in sunny sites and on flowers which concentrate the heat of the sun. Blowflies lay their eggs on carcasses that are exposed to the sun and the development of maggots is always faster on the sunny side of the carcass. Arctic bumblebees are the only Arctic insects that can produce their own heat - by rapidly vibrating their wing muscles. The metabolism of Arctic insects is adapted to the conditions and they can develop and grow at lower temperatures than their temperate relations. The wings of Arctic insects tend to be reduced or are absent altogether. This may help them to stay put in windy conditions or perhaps they do not have enough time or resources to devote to the development of wings during their brief growing season. They have various mechanisms for surviving subzero temperatures (see Chapter 5). 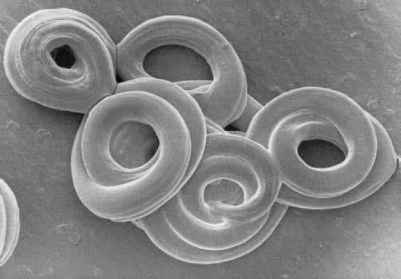 Other Arctic land invertebrates include nematodes, rotifers, tardi-grades and annelids. Phytoplankton, including diatoms associated with the ice, are the primary producers of the Arctic ocean. These are consumed by zooplankton (especially crustaceans such as krill) and the food resources of the ocean are exploited by seals, walruses, whales, polar bears and a variety of seabirds. Members of the auk family, guillemots, razor-bills, puffins and auks themselves have a similar lifestyle to the penguins of Antarctica, although they have retained their ability to fly. Open icefree areas of water (polynas) are important for marine mammals and birds, particularly polynas which are recurrent and remain open during the winter due to local conditions of wind and currents. Polar bears feed mainly at sea (on seals), but in the summer they also feed on land, catching lemmings and nibbling berries. Unlike the Antarctic, the Arctic supports several terrestrial mammals and birds. The majority of birds migrate south to avoid the harsh winter but return to the Arctic to take advantage of the spring growth of plants and the emergence of vast swarms of insects. Permanent bird inhabitants include the ptarmigan and snowy owls. Both these birds are well insulated by feathers; indeed, snowy owls have the best insulation of any bird. Ptarmigan burrow into the snow at night to reduce their heat loss. Only a few Arctic mammals, such as the Alaska marmot and Arctic ground squirrel, hibernate to avoid the winter. Arctic hares, lemmings and other small rodents like shrews and voles remain active throughout the winter, surviving by burrowing into the snow. Their small size means that they cannot themselves control heat loss sufficiently to survive the winter, but snow is an excellent insulator and temperatures beneath the snow are maintained at —10 to 0°C, despite much lower air temperatures. Light may even penetrate beneath the snow, allowing grass to remain green and provide food for the animals. Large herbivores such as caribou, musk oxen and reindeer rely on vegetation on ground which is free of snow, or where the snow cover is sufficiently shallow for them to expose the vegetation by digging. Musk ox are the large mammals perhaps best adapted to the harsh conditions of the Arctic tundra and polar desert; it is the only one which is restricted to these regions. Its adaptations for conserving heat include a large size, low compact body shape and a dark, thick, woolly coat, which hangs beneath its body forming a protective curtain. Herds of caribou migrate south to spend their winter in the forests, accompanied by the predators which prey on them. Mammalian predators include the Arctic fox, wolves, wolverine, ermine and stoats. Arctic foxes are so well insulated that they can sleep on open snow at temperatures down to — 80°C for up to an hour without their core body temperature decreasing. They can generate heat internally, but the rate of metabolic heat production is not increased until the ambient temperature falls below — 40 °C. Both predators and prey grow white coats to camouflage themselves against the winter snow. Why iw the arctic an extreme environment?